Great books, prize giveaways, author visits and more—it's all part of our free Club Read program for kids, and you're invited! We meet once a month to discuss a book, do some fun activities, eat free grub from Clockwork Pizza or Streets of New York and have a great time. Earn points for free prizes. Sign up today (it's free) and get your Club Read badge, bookmark, temporary tattoo, and lanyard. You get 3 bonus points just for attending the Club Read meeting, and an additional point when you buy the Club Read selection at Changing Hands. You can also save your points for all kinds of cool prizes, from books and toys to Changing Hands gift cards. 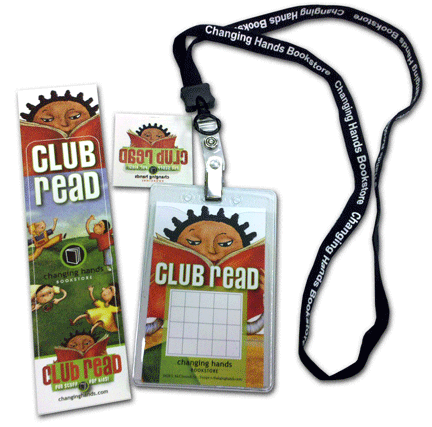 Call 480.730.0205 or stop in the store to get your free Club Read stamp card, lanyard, bookmark, and temporary tattoo! All are welcome, but Club Read is ideal for ages 8 to 12. Looking for the next pick? CLICK HERE to find out what we're reading next month! Be the first to know! Stay connected with email updates, special offers, and late-breaking event details. CLICK HERE to sign up online or you can sign up in the store.